Us urbanites live in a world of intimate anonymity. We routinely interact with people for years yet rarely discover more than one fact about them. For example, I knew my barista had a fetish for orange nail polish, she knew I was particular about my milk temperature (185 degrees). I knew my corner grocer took secret smoke breaks during downtime, he knew I bought Nutella at midnight. This was all we knew about one another. In my lightening fast life, I never quite found the time to fully flesh out the characters that surrounded me. What if I slowed down to ask questions and build them out? I decided to start with two women I saw each day at work. Monica and Roberta were Peruvian sisters with wise faces and busy hands. They took care of the IDEO café and as a result, us. They ensured we had homemade soup, fresh baked cookies, and clean dishes every week. They politely looked the other way when I gobbled 3 cookies in a row and complimented my Spanish even after I mutilated a verb conjugation. Outside of their kindness, I knew very little about them. In my best Spanglish, I asked if I could interview them over lunch. They smiled and agreed. Monica, the youngest, was plump and jovial, talking excitedly with shiny adjectives. Roberta, four years older, was petite and demure, choosing her words as carefully as IDEOers choose their fonts. We only talked for an hour but Monica and Roberta morphed from one-dimensional sketches to real people with beautiful stories. The second thing I learned was their first language-it was Quechua, the ancient tongue of the Incas. Spanish was second, and English third, learned as soon as they moved to the US in their 20s. Few American expats take the time to learn the language of the country they occupy. Even fewer change their name to ease the local’s pronunciation bias. As English speakers we are either lucky or lazy. Empatatriz – Monica and Roberta were two out of 12 children born in a Peruvian mountain valley in the early 1950’s. “Such a happy childhood,” said Roberta. Their parents were farmers and spent long days working the land to feed the family. There was one harvest a year so they had to preserve food for the remaining 11 months. “We made dried jerky, cheeses, quinoa, and beer,” said Roberta. “Women in that day didn’t go to school. They were only to be housewives,” said Roberta. Roberta and Monica were allowed to study, although Roberta left before graduation when an older sister sent her a plane ticket to come to San Francisco. She promptly went to school to learn English and took a job as a janitor. Two years later Monica came with her husband in tow. “The first year was hard. I was suffering. It was so different, the food, the language, the air. We cried all the time,” said Monica. “But, in the US you can live so much better if you push on and work hard,” said Roberta. “Yes, that’s all you need, hard work,” Monica said. “In Peru you must have four year college degree from good university and money to do anything, even go to a restaurant. People look at how you dress.” Monica explained that strict dress codes automatically prohibited the common Peruvian from entering finer establishments. “You can do anything here.” Monica said. “So we started a business.” After janitorial and clerical odd jobs, Monica and Roberta started a business together in the 80’s making silk screen ‘tourist sweatshirts’ adorned with cable cars and bridge silhouettes. They sold them at San Francisco’s Fisherman’s Wharf and Cannery Row in Monterey. “No, $12,000….it was $12,000!” corrected Roberta. They saved enough money to buy a house where they all lived together. After the 1989 earthquake, business plummeted but the sisters adapted. Roberta used her seamstress skills to make drapes and Monica drove a bus. However, the entrepreneur urge stirred again and they soon started a janitorial business with IDEO as a client. They clean and thankfully for us, also cook up amazing dishes. “In Peru we couldn’t work at our age!” said Monica. “We wouldn’t be able to get work past age 30 unless we had a degree from a four year college. I asked if Roberta was married. “I am single,” she said. I looked at the 62 year old women in the eye, hoping to lure out a secret. “They say a woman’s heart is like a treasure chest, with many gems inside….” I said, hoping to uncover a secret flame. We looked at each other and an understanding passed between the deep parts of our eyes. Roberta mentioned a trip she took with Monica’s daughter in 2008 to Italy. Roberta and Monica showed me photos from their albums, filled with ethnic dance shots, family portraits, and many smiles. Sharing lunch and life tales didn’t make us best friends, but it did move us away from being strangers. My IDEO world, once vast, started to get a little smaller and warmer. And now I have another reason to visit Peru. 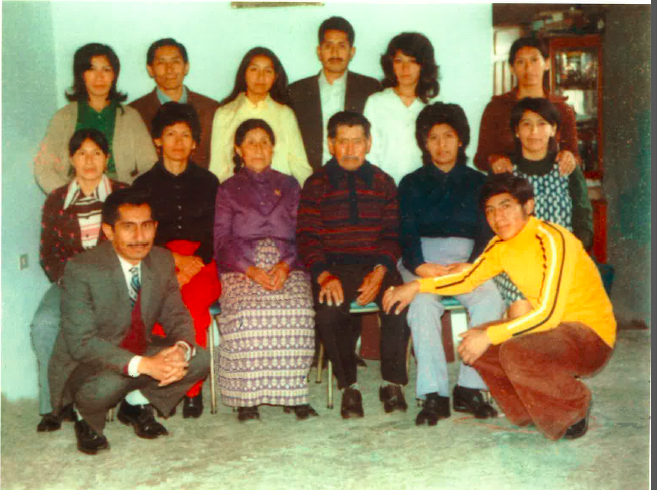 The entire family in Peru from the 70s to the 2000’s….